The Tre Kronor series of knives have set new standards for comfort and reliability from Fallkniven. The TK series combines the well-known characteristics of Fallkniven knives such as their durability and strength together with an outlandish style that has to be used to be fully appreciated. The TK3 series has also been variously described as attractive and very light to carry around. It also boasts fallkniven’s new steel combination where you have a core made out of SGPS steel while the sides are made out of VG2 steel, which is known for its anticorrosive properties. The TK3 comes in a size which makes it pretty much ideal for daily tasks. The TK3’s beautiful design is the result of a painstaking and lengthy refinement process which focuses on the concept that a folding knife should be as versatile as possible. The TK3 is surely extremely strong and sturdy apart from being very safe to use. The blade also locks due to a mechanism that keeps it in its place when opened. You are assured of the highest quality at all times for these knives since they are manually made so no knife is actually exactly like the other. 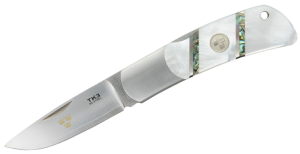 However the real thing about this TK3 MOP knife is its mother of pearl handle. Everyone knows that real pearl is probably one of the most exclusive materials in the world where knife handles are concerned. The material used here is triple A class Mother of Pearl which is supposed to be the best in the world for pearl. The pearls used for this handle come from industry grown banks which guarantee their utmost quality.